What do you get when you take a toilet, a shower, an bathtub and a sink and add two thousand litres of water? A cracking great art installation, that’s what. The indomitable Nicholas Folland has descended onto Canberra with his own brand of melodrama and tragic beauty. His new installation without reason opens at Canberra Contemporary Art Space this Friday, and I can barely contain my excitement. Folland is quite possibly become one of my favourite Australian artists, and being asked to write the short catalogue essay for the show sent me into a completely unprofessional dither. I managed to pull myself together, and the results are below. I hope it wets your appetite for the show, because you’ve really gotta see this for yourself. CCAS closes for the Christmas break on December 19, but the show continues next year from 18 January to 13 February. Someone’s left the water running. In the bath, the sink, the toilet too. The bathroom is flooded. So much so it threatens to set adrift, the floor keening with a sickening tilt. 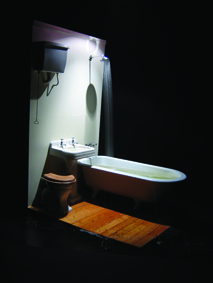 Beneath a single light bulb in a darkened corner a domestic bathroom is exposed as a victim of its own incapacity. Come alive by mysterious means, or perhaps as the result of human carelessness, this familiar, homely scene is now threatening and distorted. Melancholic strains of Greig’s Holberg Suite Opus 40 join the rushing of water in an inescapable aural assault. In the half-light, the effect is one of tragic theatre. Like a helpless witness before a bleeding wound the onlooker is struck by the palpable urgency of the situation. The pulse quickens, alarm sets in. Tidiness, order and safety are lost as the self-made sanctuary of the home is thrown into chaos. In a nation where water is a rare commodity, this dramatic outpouring smacks of decadence. Confronted with such loss the emotions move from shame to anger, before giving way to panic. Water, with its dual power to give life and to take it away, is ultimately one of nature’s most uncontrollable forces. Rushing forth unchecked it heralds disaster and calamity. Here the bathroom, that symbol of modernity and feat of human engineering, is overcome, unable to manage the torrents surging through it. It is as though this human system has been reclaimed by nature, reverting to the organic forms it emulates: the river, the waterfall. We have appropriated nature, and in turn, nature appropriates us. A piece of suburbia transformed into a wild landscape. On the fringe and in the darkness a canary keeps a lonely watch, his fragile figure dutifully monitoring the danger of our situation. His persistent, joyful song is in direct contrast to his fragility and disposability, bringing to mind all small creatures who are martyrs for the human cause. As long as he keeps singing we know we’ll be okay. Two maps presented on the wall offer similar comfort. These deep expanses, Indian Blue #2 and Pacific Blue #2 are in fact meticulous representations of the open sea. To map the ocean seems an attempt to order the inorderable, a well-intentioned yet futile task. Yet for all their seeming absurdity, the regimented grid lines offer clarity and consolation. To a traveller lost they become a whispered promise of survival, a suggestion that there are those who have gone before. The maps, as romanticised objects, conjure idealistic notions of exploration and survival, of conquering the unknown. Raft #2 becomes a manifestation of our vulnerability. Our attempts to separate ourselves from nature, to extract ourselves from the natural order of things, have failed. Despite our best efforts we are still fragile. Despite our warning systems, despite our mappings and explorations, and for all the constructed facades we brandish against our fallibility. As much as it may represent our shortcomings, the bathroom floats in precarious balance; a fragile offer of survival against the present catastrophe. It is at once our hope and our undoing.